THE B-MOVIE NEWS VAULT: Umbrella Entertinament's February & March 2019 New Releases! Umbrella Entertinament's February & March 2019 New Releases! UMBRELLA'S FEBRUARY SLATE IS PRETTY SPARSE, BUT MARCH IS CHOCK FULL OF WEREWOLVES! Umbrella's February titles are now available (as of 02/06), but sadly there really weren't any new Cult, Horror, or Ozploitation films released. However, that doesn't mean that there's nothing worth mentioning! IN LIKE FLYNN has future movie star Errol Flynn (Thomas Cocquerel) on a quest for gold in Papau, New Guinea while WALKABOUT has two orphaned kids being rescued by a young Aborigine boy. March is much more promising with the release of the completely bonkers HOWLING III: THE MARSUPIALS (which was recently released here in the States by Scream Factory) along with the HOWLING COLLECTION on DVD (which contains HOWLING III, IV, V, and VI: THE FREAKS)! Also coming to DVD & Blu-ray in March are two family classics: STORM BOY, the enchanting story of a kid and his pet pelican, and WATERSHIP DOWN, which is a (not so) cute tale of warring bunnies! To learn more about these Umbrella titles, and two see the full list of all their new February and March releases, please continue reading! * On April 3rd, Umbrella is bringing THE NAVIGATOR: A MEDIEVAL ODYSSEY to Blu-ray with an audio commentary, an interview featurette with director Vincent Ward, trailer, and still gallery! 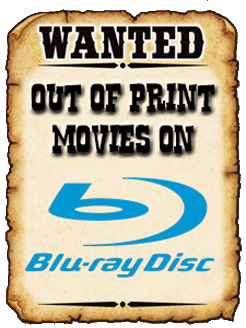 This film will also be available on a bare bones DVD release. * Also due out on April 3rd is DEATH WARMED OVER! This forgotten cult revenge flick comes to Blu-ray with a smattering of cool extras, including: Director's commentary, cast & crew interviews, the original New Zealand VHS cut, trailers, and more! This title will also be available on (bare bones) DVD. * MAD DOG MORGAN joins Umbrella's Ozploitation Classics line on April 3rd, and gets the royal treatment on Blu-ray! Two audio commentaries, a making-of featurette, interviews, trailers, and more! Synopsis: In 1930, before Errol Flynn (Thomas Cocquerel) became one of the biggest movie stars in Hollywood, a young Errol, braving cannibals and crocodiles, searched the jungles of Papua New Guinea for his Eldorado. While serving as a guide for a Hollywood producer, Errol discovers a map on a dead prospector that he believes will lead to a fortune in gold. Back on the streets of Depression-era Sydney, Flynn rounds up a ragtag crew to help him find the gold, including Rx, a Canadian ex-bootlegger, Dook, an English gentleman handy with a pistol and Charlie, a grizzled old salt. After stealing the Sirocco, a yacht belonging to Chinese Opium smugglers, Flynn and crew set sail. They quickly learn just how perilous a voyage up the Australian east coast can be, running afoul of drunken cowboys, corrupt cops and local thugs before being intercepted by the Chinese smugglers, who are hell-bent on retrieving their Sirocco and the several pounds of opium stashed in the hold. As Flynn and crew make a final dash for New Guinea they encounter their greatest foe yet, nature itself and sail straight into a treacherous reef. IN LIKE FLYNN is a mythical and satirical coming-of-age story about four men on a journey to find hope, adventure and fortune in an age when the world was spiralling into despair. 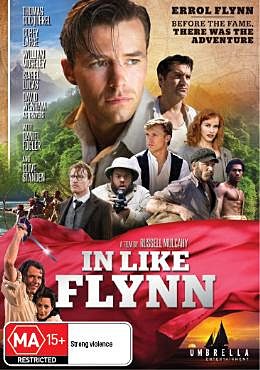 ORDER "IN LIKE FLYNN" ON DVD NOW FROM UMBRELLA ENTERTAINMENT OR AMAZON.COM! Synopsis: Under the pretence of having a picnic, a geologist (John Meillon - CROCODILE DUNDEE) takes his teenage daughter (Jenny Agutter - The Avengers) and 6-year-old son (Lucien John - WE NEED TO TALK ABOUT KEVIN) into the Australian outback and attempts to shoot them. When he fails, he turns the gun on himself, and the two city-bred children must contend with harsh wilderness alone. They are saved by a chance encounter with an Aborigine boy (David Gulpilil - STORM BOY) who helps them survive, and in the process underscores the disharmony between nature and modern life. 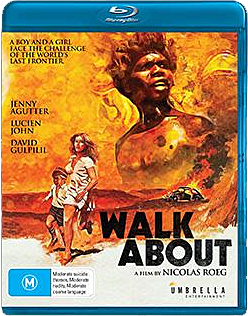 ORDER "WALKABOUT" FROM UMBRELLA ENTERTAINMENT ON DVD OR BLU-RAY! Synopsis: A strange race of human-like marsupials appears suddenly in Australia and begins to create havoc. A sociologist who studies these strange creatures falls in love with a beautiful woman who happens to be marsupial. Audio Commentaries with Director Philippe Mora. COLONIAL LYCANTHROPY: A Conversation with Philippe Mora. Extended NOT QUITE HOLLYWOOD interviews with Director Philippe Mora and Special Effects Artist Bob McCarron. ORDER HOWLING III: THE MARSUPIALS ON BLU-RAY NOW FROM UMBRELLA ENTERTAINMENT! Synopses: This four-disc set contains the remainder of the original HOWLING franchise! HOWLING III: THE MARSUPIALS - A strange race of human-like marsupials appear suddenly in Australia, and a sociologist who studies these creatures falls in love with a female one. Is this a dangerous combination? HOWLING IV: THE ORIGINAL NIGHTMARE - A successful author moves to a new town after suffering a mental breakdown and is tormented by demons and werewolves. HOWLING V: THE REBIRTH - A group of strangers visit an ancient Hungarian castle and bring along a werewolf. HOWLING VI: THE FREAKS - A villainous carnival owner traps a young werewolf to include in his growing menagerie of inhuman exhibits. 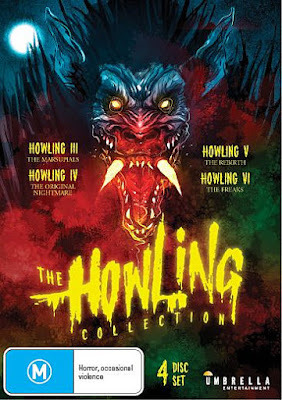 GET "THE HOWLING COLLECTION" ON DVD FROM UMBRELLA ENTERTAINMENT! 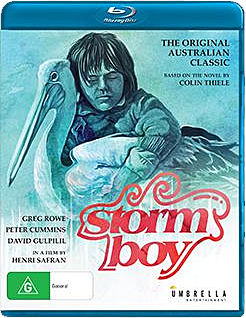 Synopsis: Storm Boy (Greg Rowe - BLUE FIN) lives with his recluse father, Tom (Peter Cummins - RETURN TO SNOWY RIVER) on South Australia's lonely and beautiful coast. Here his free spirit roams with his pet pelican, Mr. Percival, and his secret Aboriginal friend, Fingerbone Bill (David Gulpilil - CARGO). STORM BOY, growing up is forced to choose between a life of continued isolation and the challenges of the outside world. Story Makers: Colin Thiele - 1988 documentary on the authour of Storm Boy. BLUE FIN (1978) Bonus Feature Film! ORDER "STORM BOY" FROM UMBRELLA ENTERTAINMENT (DVD | BLU-RAY) OR AMAZON.COM (BLU-RAY)! Synopsis: The timeless animation classic based on the best-selling novel by Richard Adams. Nestled among the peaceful meadows of country England lives an idyllic community of rabbits but when warned that their warren will be destroyed, a small group escapes into the unknown countryside in search of a new home. Led by the visionary Fiver, the courageous Bigwig, the clever Blackberry, and the honourable Hazel, the rabbits face daunting challenges as they struggle to pursue their dream, battling the vicious General Woundwort, the cruel leader of another warren, but also making an unlikely friend - a batty seagull named Kehaar. Director Martin Rosen brilliantly frames the tale from the rabbits' point of view, while the affecting, painterly animation style further allows the viewer to identify with each character's engrossing journey. Over 40 years since its initial release, WATERSHIP DOWN remains a compelling tale of courage, loyalty and thrilling adventure. 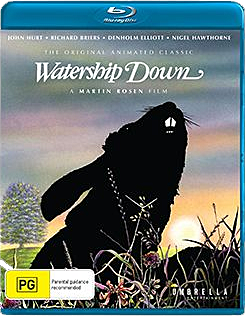 ORDER "WATERSHIP DOWN" FROM UMBRELLA ENTERTAINMENT ON DVD OR BLU-RAY!